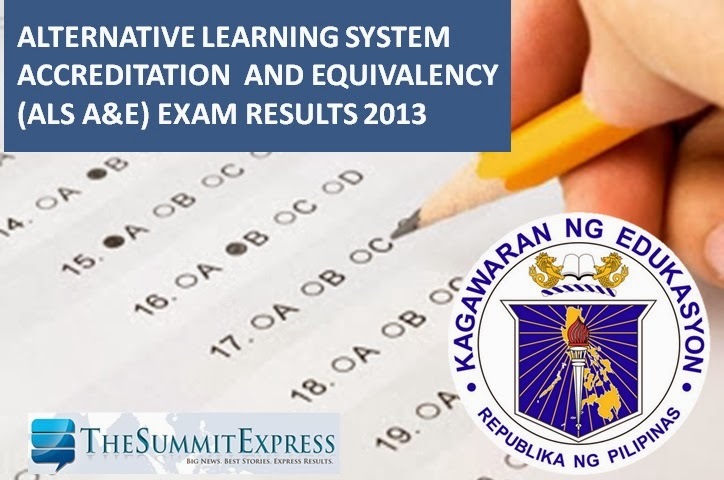 Manila, Philippines - The Department of Education (DepEd) released today, February 21, 2014 the results of October 2013 Alternative Learning System Accreditation and Equivalency exam (ALS - A&E). In the elementary level, 6,135 of the 24,998 applicants passed the test while 72,076 of the 221,598 are successful in the Secondary level. The complete lists of passers for Elementary and Secondary are now posted online. ALS A&E was administered in 17 regions nationwide by the Bureau of Alternative Learning System (BALS) of DepEd. It is a paper and pencil test (PPT) which used to be known as the non-formal education test. Education Secretary Br. Armin A. Luistro FSC said that the test also given to visually-impaired test takers via Braille. The A&E registration, administration, and certification are provided free by DepEd. Passers of the A&E are given a certificate or diploma, signed by the DepEd secretary, certifying the passers’ competency as comparable to the graduates of the formal school system. Targets of the A&E are school drop-outs, those who have not attended the formal school system, homeschoolers, or others who have not finished basic education but are basically literate. Follow Us on our social media channels - Facebook and Twitter to receive updates about ALS A&E tests. Bookmark this page now or subscribe to our e-mail list.